In my last post I explained a bit about what the ZPD and scaffolding are and what scaffolding looks like when “teaching” babies how to roll over. In this post, I’ll provide a couple of examples of scaffolding the writing process. I’d like to start by pointing out that writing is not a single skill, but rather a number of skills that come together into a finished product. In order to write, say, a thank you note that you would like your friend to read, you must 1) conceive of the idea of writing the note, 2) choose the words you need to express your gratitude, 3) decide which letters are in the words you want to write, 4) form the letters on the page, 5) plan ahead so you don’t run out of room and 6) put the words in order. I’m sure I could think of more skills involved, but we’ll leave it at that. So that’s at least 6 things your child is doing if he’s trying to write something on a piece of paper. It’s a big task. The first trick to scaffolding is identifying when your child is on the verge of moving up the skill ladder and determining what kind of support he needs to make that step. The next trick to scaffolding is recognizing when your child needs to just hang out and get comfortable on the rung he’s on before trying to make the next step. I have no idea what those say, though I do spot the word “the” in the second picture. 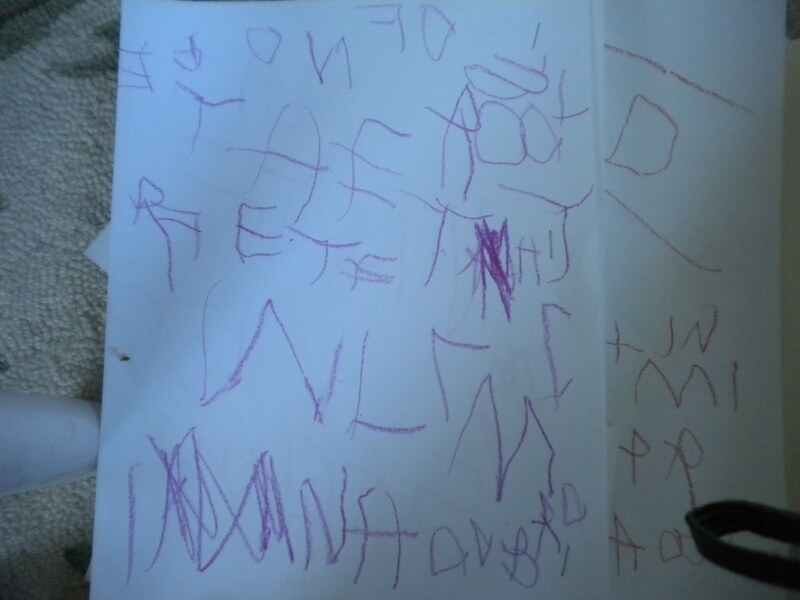 One day, feeling a bit frustrated, I told him that you have to write from top to bottom and left to right or people can’t read it and it doesn’t make sense. I wanted to show him. I wanted to have him rewrite what he’d written. He wanted to punch me in the nose. I really should have kept my mouth shut in that situation. I wasn’t scaffolding, I was pushing. He’s not ready to move to the next step. He’s still getting comfortable with steps 1 through 4. The effect of my “help” was to make him feel incompetent and angry. I shut down all learning opportunities at that moment and replaced them with a flood of frustrated tears. So there’s a great example of what not to do. But every once in a while my instincts are better. My little girl is also learning to write. She’s not really “writing” as defined in the 6 step process above; she’s pretty much just forming letters on the page. 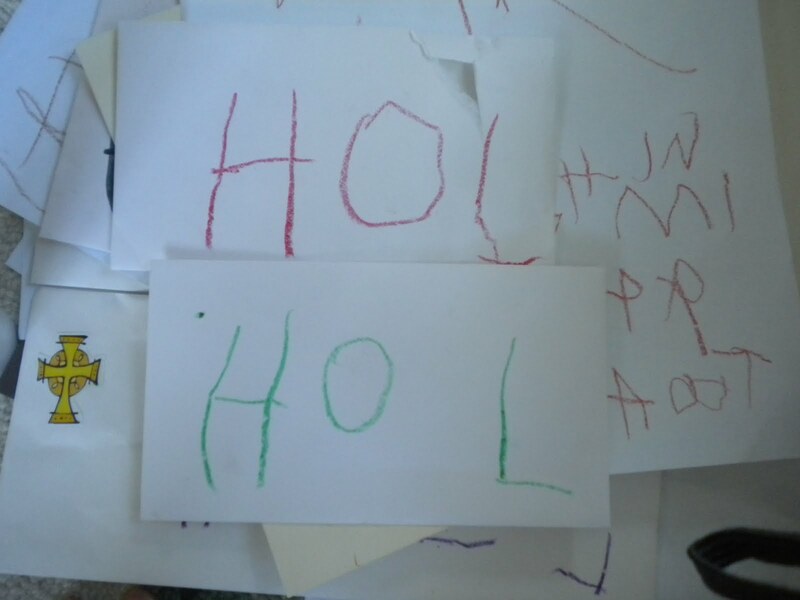 Her fine motor skills are more mature than her brother’s and she is able to form letters quite small and neatly. 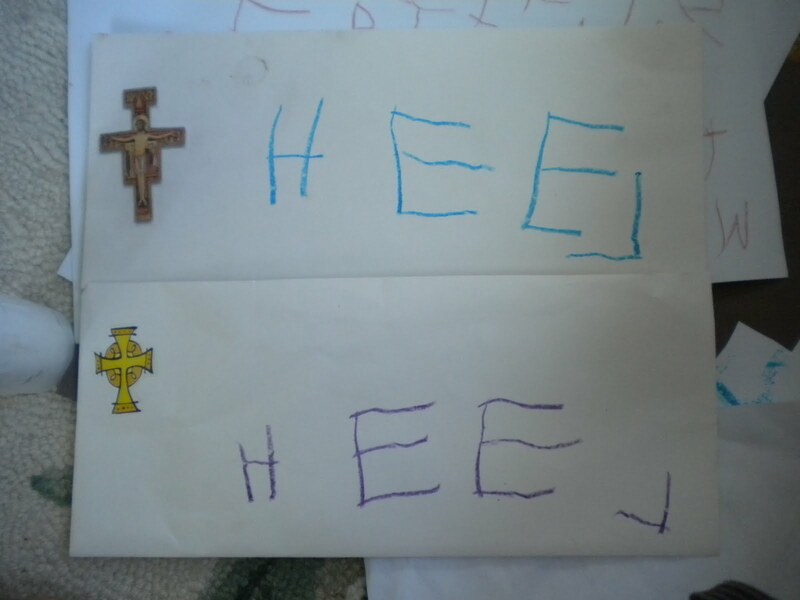 She doesn’t know all of her letters, but she is very interested in writing her name and has picked up that “H” is the first letter of her name. Note that she is practicing. She’s doing the same thing over and over. Not because I told her to. Not because she has a worksheet to complete. She’s doing it because writing her name is important to her right now. Also note that up to this point, I hadn’t given her any instruction on writing her name. We’d talked about how Henry and Helen both start with H. We’d pointed out H’s. Everything else she’d picked up just from living our daily lives. So in this case, the scaffolding I provided was a model for her to copy. Note that it still isn’t quite right. But it’s a lot closer than HOI. The letters aren’t in the right order, the “L” is backwards, and there’s no “N” at all (probably because she doesn’t feel up for tackling that diagonal line), but the model I gave her bumped her up to a new level of competence. My job now is to stand back and let her get comfortable at this level until she’s ready for my help to move up the next rung of the ladder. How will I know she’s ready? More than likely it will be because she asks me. If I felt I just couldn’t hold back, I could ask her if she wants to learn to draw an “N.” Because I know she’s capable of tracing small letters on a page, I could print a handwriting worksheet for her and show her how to do it. But if I did that, I would be careful to present in a pretty nonchalant way. “Hey Helen! I put a worksheet on your writing table that shows you how to write the letter ‘N. '” And leave it at that. If she asked for help with it I would help her. If she ignored it, I wouldn’t bring it up again. I’d just leave it there. The essence of scaffolding is waiting until a child is super ready to take the next step and offering just enough assistance to get him there. It’s holding a child’s hand as she jumps across a little stream. As opposed to pushing her across a river in a canoe. Either way she’ll reach the other side, but if she makes the leap herself, the experience will be much more rewarding. I'm super impressed with Helen's handwriting. She's doing an amazing job for her age. Susan Wise Bauer, the author of Writing With Ease among other books, talks about all of the steps involved in writing and feels that today's education pushes kids to produce their own writing too quickly. Just as you pointed out there are numerous steps and it takes time to learn them all. I will be starting on that curriculum once Bohdin learns to write all of his letters. At this age it is copying examples of good sentences and narration. Children his age aren't required to both write and think of something to write at the same time which she feels are two separate skills. Right now we are doing some narration for history but I write it down for him. He loves history except for that part. I want him to have the ability to write well or at least better than me because it is such a useful skill so he has to do it.